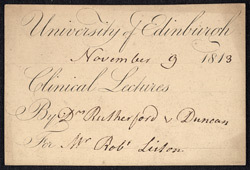 This is a ticket for a clinical lecture by Drs Rutherford and Duncan, held at the University of Edinburgh. It is interesting to note that the bearer of the ticket is Robert Liston who was the first doctor to use anaesthetics during surgery. Before anaesthetic had been developed in the 19th century patients had to endure unbearable pain during an operation and so it was important that the surgeons worked quickly. Robert Liston was a surgeon in London during the 1840s and he was thought to be the fastest of the time. He removed a 44 pound tumour from the leg of a patient in just 4 minutes!